This fruity, frothy and good-for-you smoothie can be prepared (without the ice cubes) in the blender and refrigerated overnight ready to blend in the morning. In blender, combine hulled strawberries, milk, yogurt, honey and ice cubes; process until smooth. Pour into chilled glasses. Garnish with fresh strawberry. Serve immediately. Tips: Buy local strawberries when in season; wash and remove hulls. Freeze in single layer on baking sheet; transfer to freezer bags and store in the freezer until ready to use. 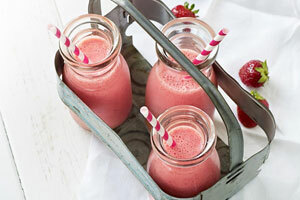 Omit the ice cubes in this smoothie and use frozen strawberries. For brunch, serve in stemmed wine glass. For fibre and Omega-3, add 3 tbsp (45 mL) ground flaxseed. Instant skim milk powder is a great way to add calcium and protein and makes the smoothie creamier. Try 1/4 cup (50 mL) in this recipe.